Wunderbar Bakery Bistro, Vernon Terrace, Teneriffe, Brisbane - my name is Food. 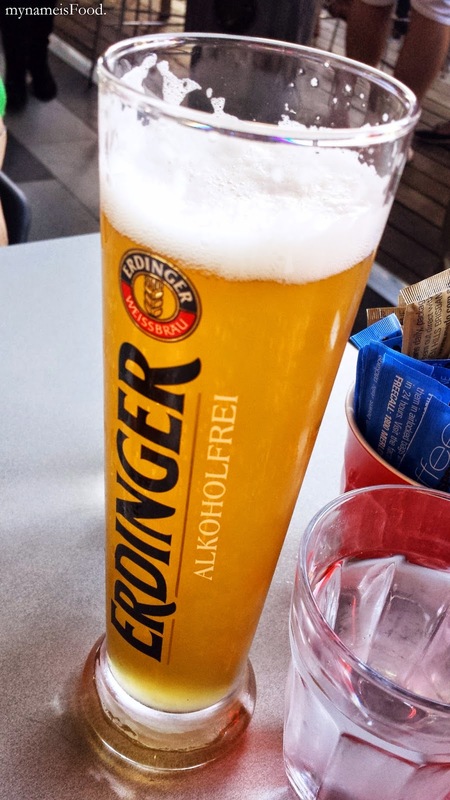 Erdinger Alkoholfrei ($7) - an alcohol-free beer since we were driving.. The place isn't too romantic nor too casual, so it is kind of in between. Service was quite good when we came in, they were quite busy and they made the effort to make us a table from the unused tables that let's say, 2 tables with only 2 diners which mean that the other table weren't used. 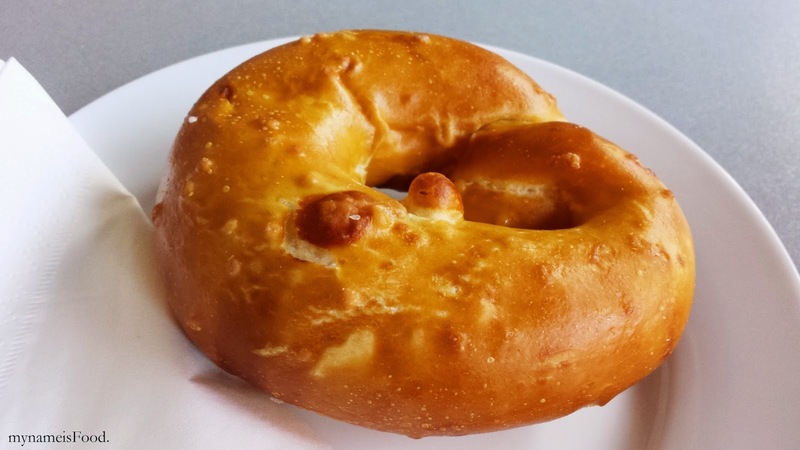 Started off with the classic 'Pretzel' which was nicer than some of the other pretzels I have tried. The mixture of the dough has been combined and knead well to make the inside the way it was. 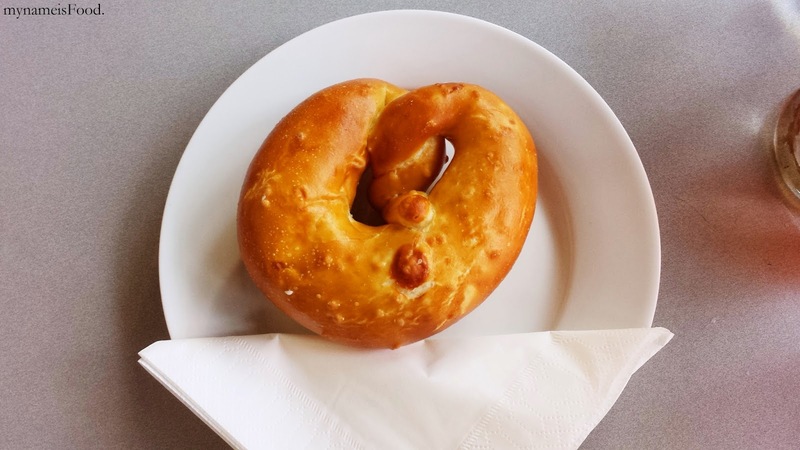 However, I was quite surprised in some way, how they did not offer any side of butter or even slice through the pretzel when serving it. It was just as if they took it out of the bread basket display and placed it on a small plate with a serviette on the side. We ended up having to order some butter on the side. 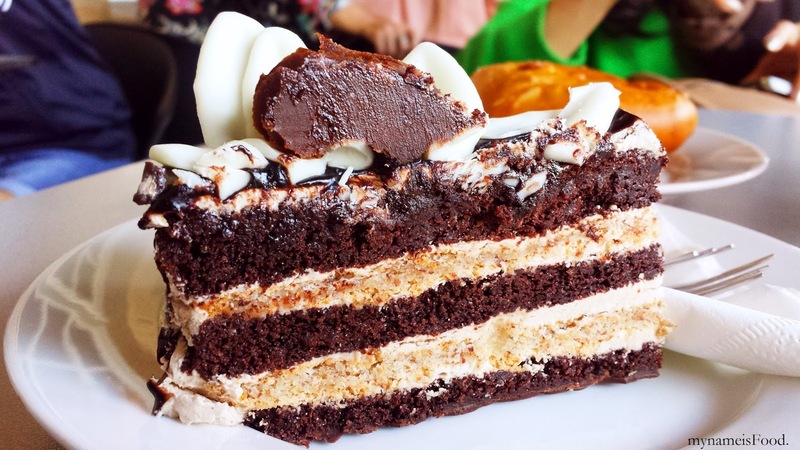 Since their cake display offered a wide range of cakes which you could buy either as a whole or in slices ranging from $5.5 to $36. I'm quite a sucker for pretty looking cakes, but I don't fancy over-sweet cakes. I'm not the type to order mud cakes or simple sponge cakes when I do order cakes. I would rather other a simple cheesecake, or a layered cake for that matter when compared to ordering mud or sponge cakes. However, I'm not too sure why, but maybe it's the fact that I can bake and make cakes too so I know what process it needs or its simplicity etc. 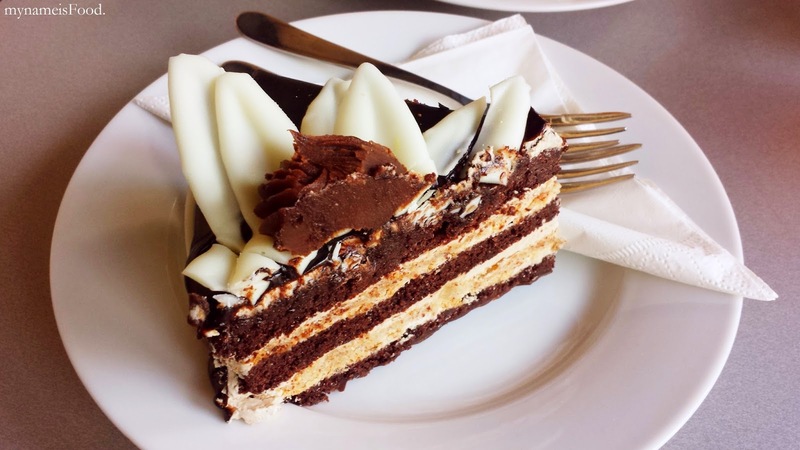 Sometimes it is true that the simple cakes are the best, and I do agree, but if I had to choose between ordering a mud cake and a cheesecake, I would rather order a cheesecake.. 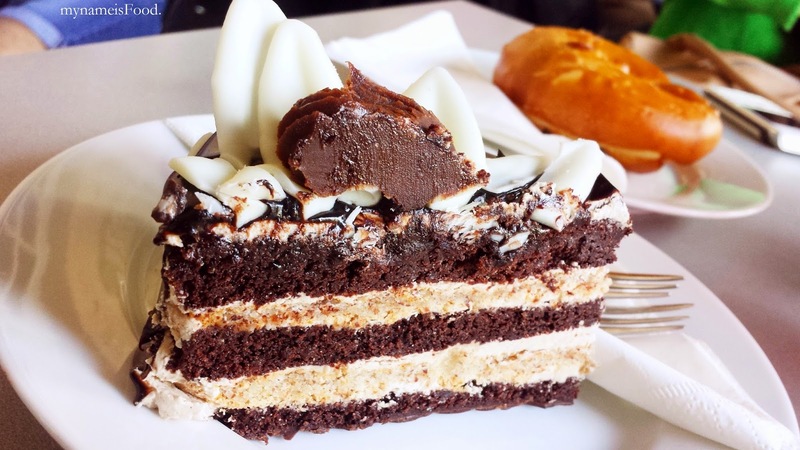 If you get what I mean..
One particular cake caught my eye and it was the 'Pischinger Torte' ($5.5), layers of chocolate sponge, hazelnut buttercream & hazelnut meringue with a hint of Baileys liqueur. Glazed in a light dark chocolate glaze, topped with a combination of white chocolate and milk chocolate.. The combination of the layered cream and sponge was quite rich but not overly sweet which was nice to have that combination. 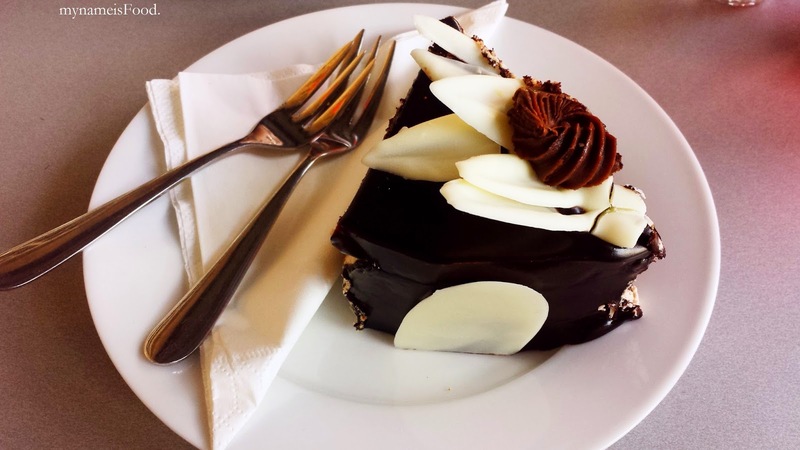 The slices are enough for one or even to share for two, but I have had bigger slices elsewhere when ordering cakes. Anyhow, I would recommend to go for their cakes here, but I'm not sure about their food.